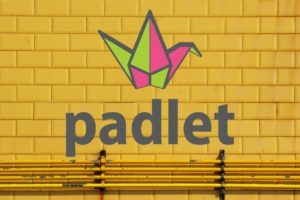 Padlet is a community-centered internet application “that allows users to easily express their thoughts on a common topic” (source) and read what others have to say. It is essentially a virtual bulletin board in which collaborators can simultaneously create and organize posts of any content type, whether it be text, documents, images, videos, links, etc. Padlet is a great tool to use for collaborative group projects, as it eliminates the need to schedule time in advance for the group members to meet face-to-face. Students are able to work freely on their group assignments at their own convenience while still observing every change or contribution made by group members as soon as they are made without scheduling conflicts and the constraints produced from limiting project work to specified times. Substitution: Students create their own Padlet with text-based posts (rather than putting Post-it notes on a class bulletin board). Augmentation: Students continue to work on the Padlet outside of class over the next few weeks. Modification: The students then give one another’s posts feedback directly on the padlet. Redefinition: The students use the feedback to improve their work and then decide whether or not other posts should be approved or need improvement. History: Create a timeline to illustrate related events in a particular period, perhaps a war or governmental change. Create a timeline narrating the key events throughout the life of an important historical figure. Government / Politics: Design a diagram depicting the organization, powers, and history of each branch of the U.S. government. Geography: Build a collage covering the different regions of a particular country including pictures and descriptions of local wildlife, terrain, climate, etc. Literature: Create a book report covering important events and characters, along with descriptions and their relationships to one another. Social Studies: Illustrate research on a particular group of people with pictures and information about their traditions, attire, languages, beliefs, etc. Biology: Present a certain region’s food chain with images and labels of the animal species. Click “Sign up” and register if you would like to have your own account. Choose the design options of you padlet including your title, description, layout, wallpaper, icon etc. and click “Next” after you have chosen everything to your liking. Select your padlet’s privacy setting and the privileges that other users with access will have on your padlet. Click “Next” once you are finished. Now click “Start posting” and you are ready to begin. Click the “+” button or double click anywhere on the padlet to begin posting. You can also drag and drop files onto the padlet or paste from the clipboard. You can hit the “Padlet” icon in the top left of the screen if you wish to return to the homepage or change padlets if you are signed into an account.